When it comes to shopping, the smallest moments have the biggest impact. And for retailers, this means being there and being useful for shoppers anytime, anywhere. 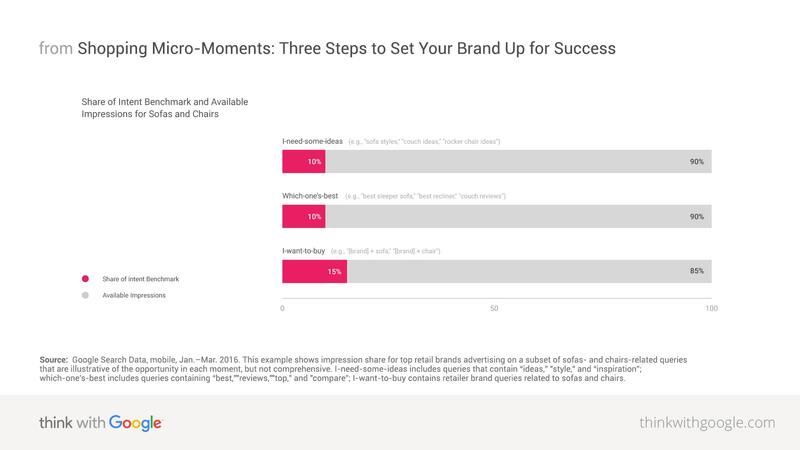 In the final part of our five-part series, we look at three steps any brand can take to start winning more shopping micro-moments. Shoppers rely on their smartphones now more than ever. From searching for ideas, to comparing which one's best, to finally deciding on the right one, they turn to mobile in all of these shopping moments. For retailers, the question is: How can you shift your strategy to keep up with mobile's growing influence on the customer decision journey? Here are three steps to be there and be useful in the moments that matter to customers. Of course, it's important to take action on the team level: test new types of ads, build new content, improve your mobile site load time, and so on. But the small stuff can only take you so far. Real change involves your whole company agreeing to take a unified approach to giving shoppers the experience they need and expect. Take this example. A few years ago, classic American department store Macy's discovered that customers who shopped both online and in-store were far more valuable―in fact, 8X more valuable―than those who shopped in a single channel. Macy's knew it had to make internal changes to better serve these shoppers. In 2014, Macy's built an organization-wide mission to win omni-channel shoppers. The company launched a pilot in its "social dresses" category, combining the online and offline merchandising and marketing teams. This gave both of these teams a single view of inventory across channels and therefore a single view of the customer. The results were so positive—with significant gains in customer experience, sales, and margins--that Macy's rolled out the new structure across all its categories in 2015. Create a cross-functional steering committee to allocate resources and influence budgets. Align incentives and performance goals among IT, marketing, product, and finance teams. Get CIOs and CMOs working closely together. CMOs own the customer experience and increasingly need to own customer data, analytics, and insights. That's why close CIO and CMO alignment is critical for creating richer and more useful experiences. 2. 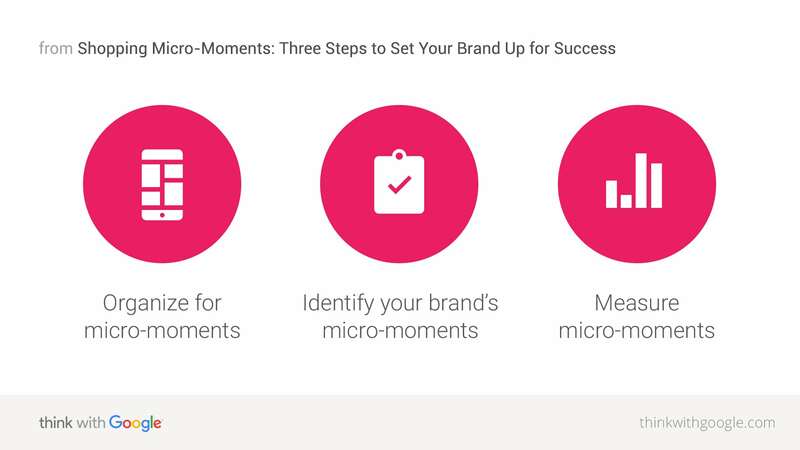 Identify your brand's micro-moments. Even within digital, there are big differences between how people shop for, say, golf clubs versus washing machines. It's important to know what the typical purchase journey looks like for your industry and business. If it's appliances you sell, what kinds of micro-moments do people in the market for a washing machine or microwave have? Break them down by I-need some-ideas, which-one's-best, and I-want-to-buy-it moments. You can also use a few tools to find the moments that matter for your brand. The Shopping Insights beta tool allows you to explore the popularity of products in cities across the U.S. and segment by date range and device. For example, you can see whether people in Boston search for "ripped jeans" and if so, whether they're searching on mobile or desktop. You can also browse curated stories of larger trends taking place across the nation. The Shopping Assortment Report in your Google Merchant Center account can also help you meet real-time demand by identifying new brands and products to add to your product assortment. The data is based on the popularity of these products on Google Shopping, offering a near real-time view into online consumer demand. Many digital marketers use last-click attribution and cost-per-acquisition as metrics for online success in a desktop world. The tendency is to try and make them the basis of measurement for micro-moments as well. But mobile introduces an entirely new set of behaviors—across devices and channels—that requires you to measure beyond the last click or the online sale. International retailer Lighting New York shifted its focus after recognizing that customers weren't buying from it on mobile. The company had treated mobile as a converting channel, but the marketing team realized that its customers were primarily using mobile as a research tool. At Google, we often look at what we call share of intent. It's a simple measure of success: the number of times your brand appears for searches in the moments where you want to be most. Consider the chart below. It illustrates the average share of intent for top brands advertising on sofas and chairs. Source: Google Search Data, mobile, Jan.–Mar. 2016. This example shows impression share for top retail brands advertising on a subset of sofas- and chairs-related queries that are illustrative of the opportunity in each moment, but not comprehensive. I-need-some-ideas includes queries that contain "ideas," "style," and "inspiration"; which-one's-best includes queries containing "best,""reviews,""top," and "compare"; I-want-to-buy contains retailer brand queries related to sofas and chairs. For example, when we look at the brands that most frequently advertise against sofas- and chairs-related searches that include "ideas," "style," or "inspiration" in the search query, we see that on average, they have a 10% share of intent. If you want to know what's working, your share of intent in those moments can be a good place to start. As your measurement techniques evolve, you start to measure the impact of cross-device and cross-channel marketing. Petit Bateau, the 120-year-old global apparel brand, is one example of a brand that's actively measuring across channels. The company knew that its customers were researching online prior to purchasing in-store, but it wasn't sure exactly where those customers were conducting their research and which channels were contributing to in-store traffic and sales. Its store teams weren't convinced that digital was playing a major role. Forty-four percent of in-store buyers visited the Petit Bateau website within seven days prior to purchasing. Consumers with the highest in-store basket value conducted up to 3X more research online before they purchased. Those who visited the Petit Bateau mobile site converted in-store at an 11% higher rate than those who didn't visit the mobile site. Mobile site visitors also spent 8% more on average. With that kind of end-to-end visibility from digital to store, Petit Bateau realized that its return from search was 6.4X higher than it had previously thought. That kind of happy number can shake up a marketing strategy pretty fast. The bottom line: The future of retail lies in the smallest moments. It's no longer critical for a shopper to be present in-store but rather for the store to be present wherever the shopper is. Many retailers, from Best Buy to Target to Swarovski, are seeing success in engaging shoppers in these moments. Are you there? 1 Google/Forrester Consulting, "A Mobile Moments Mind-Set,"Jun. 2015. 2 Mobile Commerce Daily, "Lighting New York Switches on Mobile Search With Discovery Focus," May 2016.